The Department of Placement & Training is the backbone of any College. From the very beginning the College lays greater emphasis on Industrial Training and Practical Training for college students. Our college also conducted placement interviews for the student of B.Sc., M.Sc., and B.Com. for the last few years in our campus. The Training and Placement Cell of the institute centrally handles Campus Placement for the college students. The Cell provides complete support to the visiting companies at every stage of placement process. Arrangements for Pre-Placement Talks, Written Tests, Interviews and Group Discussions are made as per the requirements of the visiting companies. 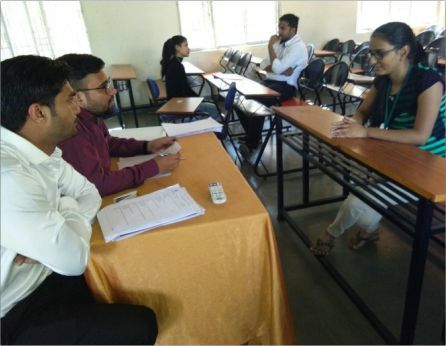 Company like; Premier Medical Cooperation, Bhumi sales, ICICI Insurance Bank , Future Group (BIG Bazaar) etc had successfully conducted interview in our campus and placed students in their firm.